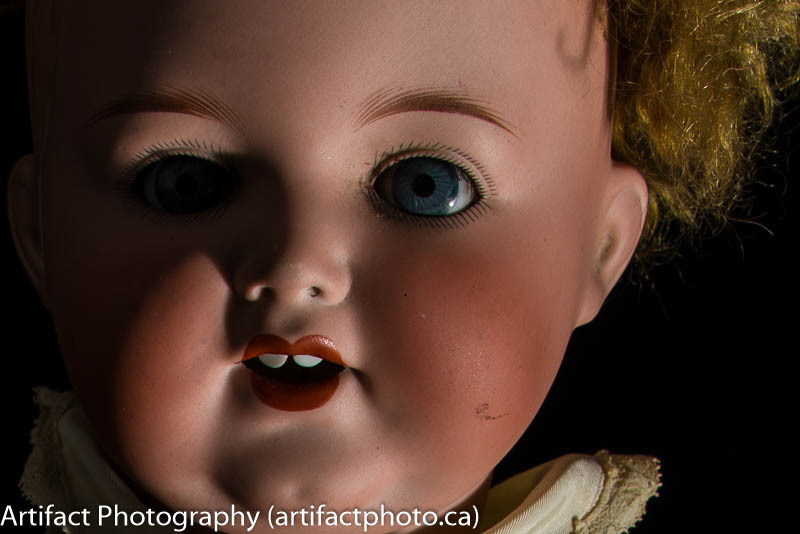 Got an antique doll that looks a bit spooky? 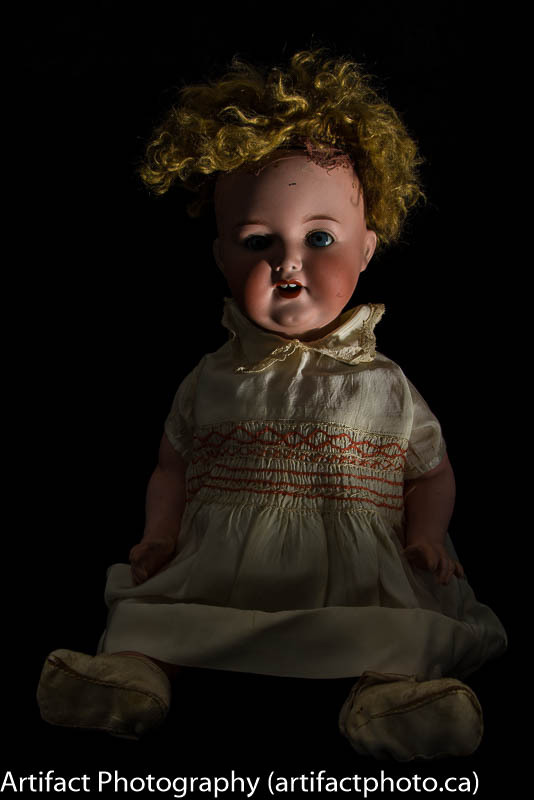 Here’s how I photographed an 80 year old porcelain doll for Halloween. This porcelain doll weirds out some of the people I’ve shown it to, and it’s always seemed a good subject for a Halloween article. She belonged to my mother when she was a child. She’s now over 80 years old and needs some repair, but when you look closely, she’s actually quite beautiful. The setup is quite simple. 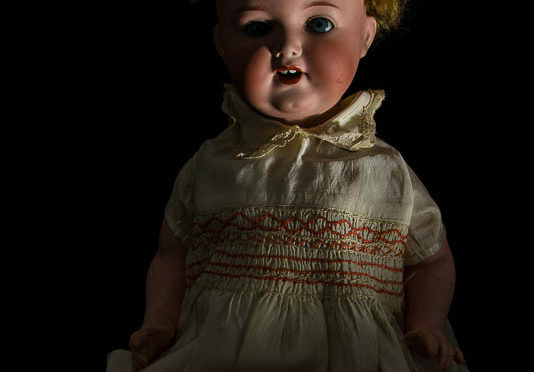 I took a black backdrop and placed the doll on it in a sitting position. It’s body is placed to a slight angle so I could do a slight over the shoulder look on the face. The eyes move automatically, but I wanted them to look directly at the camera, so after pointing the head directly at the camera, I raised the tripod so the camera came directly into the line of sight. I did no cleaning as I wanted her to look old, so there’s a bit of dust in the eye cup and some random dirt marks here and there (she really was loved). I straightened the dress so it looked realistic, but didn’t do anything special to neaten her up. I wanted to use direct light from a low position to look scary. Unfortunately porcelain dolls don’t have pores or winkles to enhance, so this is about as scary as I can get without damaging her. I tried putting the studio flash unit as low as the stand could go, but it wasn’t low enough. I ended up putting the strobe on my office chair. This resulted in a slight shadow starting at her chest down, but I just think that adds to the look. To reduce chance of noise (digital artifacts) on the dark bits, I used ISO 100 as usual, and I overexposed by two stops. In Lightroom, I lowered the exposure by two stops. This “shooting to the right” takes advantage of the fact that the chip records 50% of the digital information in the rightmost 10% of the histogram (the whites and highlights), and by the time you work your way over to the left, very little information is recorded for the blacks and shadows. If you over expose, the blacks and shadows are recorded in the much roomier mid-range, so when you put the exposure to where it should be, much more detail is retained. Therefore, no noise. I also white balanced with my grey card, enabled lens profile corrections, and set the camera calibration to my Nikon D800 profile I’d previously created with my x-Rite Color Checker Passport (see my previous article: Getting Colour Correct). I also increased my Presence settings as usual (clarity +40, vibrance +20, and saturation +10). So that’s how I amused myself today. Have fun tonight and remember to try to treat each other nicely. Be careful on the roads and try not to run over any little trick or treaters. Feel free to explore the rest of the Artifact Photography (a division of 1350286 Ontario Inc.) website at www.artifactphoto.ca.